The painting project that I finished up today holds a special place in my hobby heart. 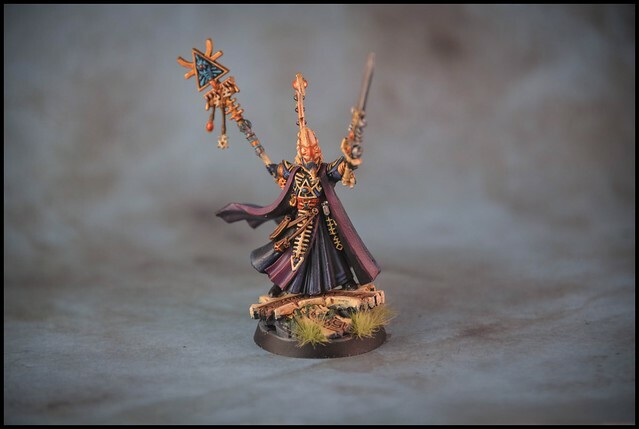 The release of the new sculpt of the Eldar farseer, Eldrad Ulthran, in the new Death Masque boxset by Games Workshop, marks the second time I have tackled the famous farseer. The first time I painted him was when I was seventeen years old and trying to raise the level of my painting skills. It was the old white metal sculpt that came out in the mid nineties. 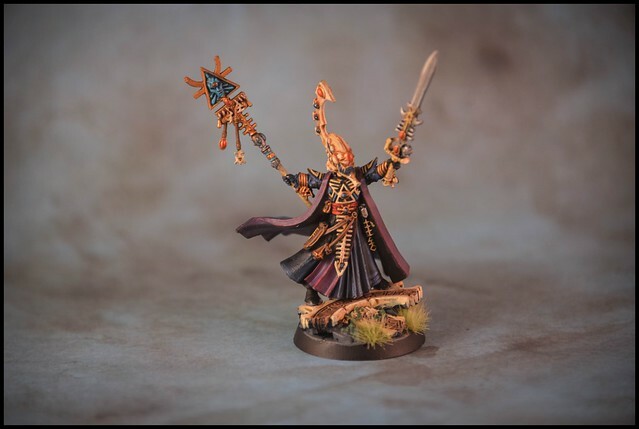 The reason it was important to me was it was the first time that something I painted was deemed good enough to be shown off in the painting cabinet of the local Games Workshop store. I worked there as a weekend job while I was at college, and had been in awe of some of the skill shown in painting the display models. There were a couple of excellent local painters that contributed to the cabinets. I set myself a personal goal to strive towards the standards they set. 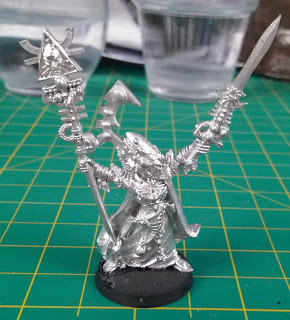 The original Eldrad was the first time that I was successful. Sure, it was hardly 'Eavy Metal standard or anything like that, but to me? To me it was the first step on a goal I still challenge myself with to this day - to keep getting better. So when the new version came out this month, I knew I had to tackle him again! The new version is a more dynamic pose, while retaining the style and form of the Eldrad I remember. I had a lot of fun painting this one, both because of the standard of the sculpt, and for the nostalgia of painting him again after all this time. The boxset itself is a great value pack. Lots of cool stuff for me to paint in there! 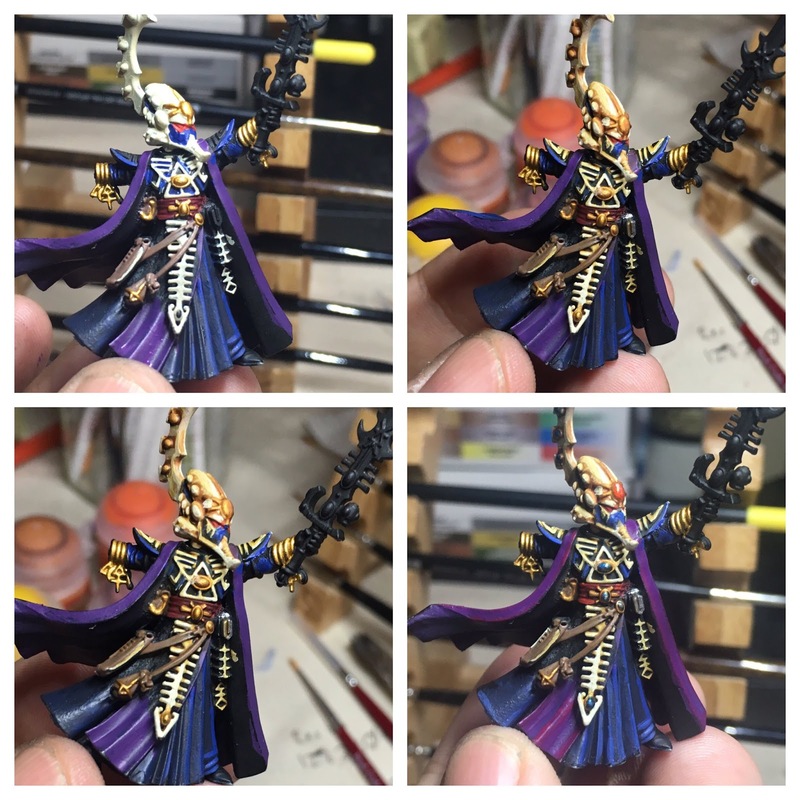 Next up I'll probably start on some more of the Death Watch, but the Harlequins are tempting too!